One hundred years ago, there was a young boy who was seeking a unique rose for his beloved girl. It was a freezing winter night, and all roses had died. After a long time searching in the withered rose bush, the young boy was desperate. Touched by his true love, a nightingale, who heard and understood his wish, sang all night under the cold moonlight. Just before dawn, a rose stained with the blood of the nightingale, bloomed, bright and fragrant. Enjoy the beautiful story in our video! The writer Oscar Wilde, created a red rose for true love out of the nightingale’s song under moonlight. To Wilde, the unique rose stained with blood of the nightingale is the symbol of love and true art. 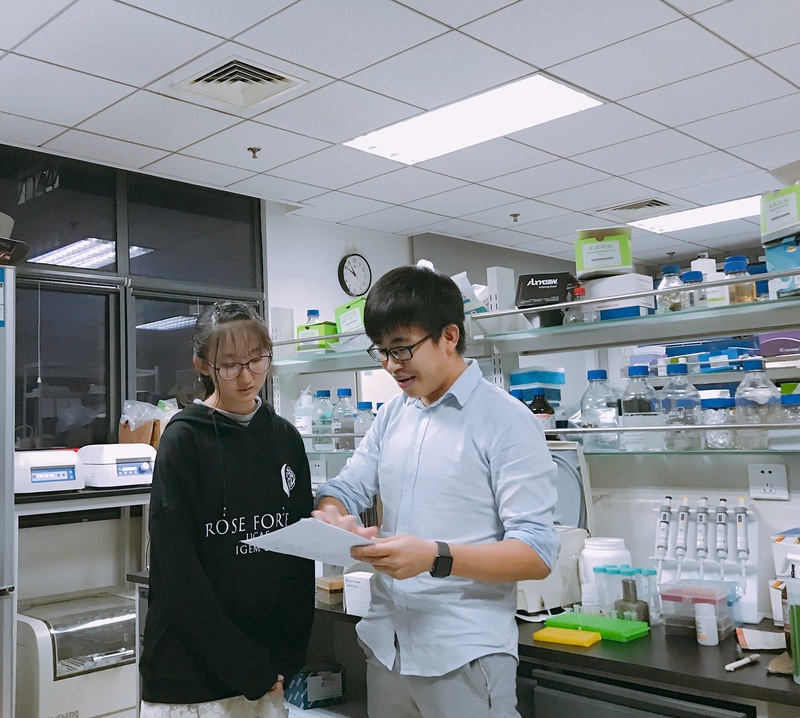 To us UCAS-China iGEM team, the touching story should be passed down to our generation and explained in a scientific and creative way using the tools of synthetic biology. Furthermore, as Wilde conveyed in the story, the barrier and combination of art and science still remain worthy of discussion, so we also explored in depth the relationship of art and science in the Human Practices section. Our project combines the four elements - music (the song of the nightingale), light (the moonlight), color (the stained rose) and odor (the rose fragrance). In our project every iGEMer is able to create his/her own rose with unique soul, together to form our rose forest in the junction of art and science! In our project, E. coli needed light and sound as inputs to produce color and odor as outputs. The process was mainly divided into three parts: sound to light, light to color, and light to odor. The light-color and light-odor conversions were achieved with the RGB system which was based on the phage RNAP system as a resource allocator. As for the sound-light conversion, we developed a software that allowed users to upload their own music to generate their unique dynamic pictures, with which people could color and ‘ensoul’ their own roses. We introduced the RGB system to stain our rose using light. 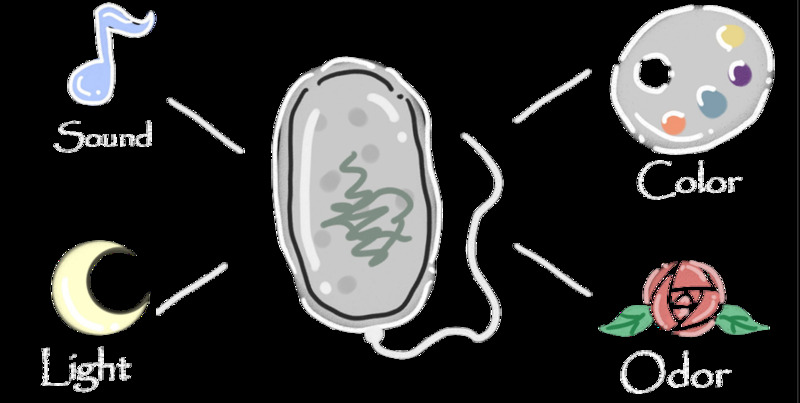 We also put forward a new concept—mixing color into bacterial cells! Unlike the mix of different bacterial cells which produce different colors as the previous iGEM teams have done, we used tandem expression and RGB system to control the ratios of the expression of different colors in bacterial cells, to achieve mixing color in bacterial cells, and stain our roses with more bright colors. Our roses are colorful now, but only with added fragrance can the rose bloom more vivid, appealing and with a soul as a real rose. So this is our second part, light to odor, making our roses more soulful and real. We first tried to use CRISPR/Cas9 gene-editing system to knock out the original gene of E. coli producing smell to prevent E. coli from giving off a nasty and unpleasant smell. Then based on the light-control system, we changed the actuators with genes which could produce various kinds of odors. We could paint a colorful and fragrant rose with light , but it was sound that brought a unique soul to the rose. To create his/her rose with a unique soul, we developed an online software—Orpheus—to convert music into unique colorful pictures. The users could choose their music or their own voice, and the pictures that they want to ensoul, to color the pictures with random colorful dots. When the music is input, after a specified time, the sound waves will be read and the amplitude and frequency of the music will be extracted. The diameter and the color of the dots vary with the amplitude and frequency of the music, and the pictures thus they are painted with beautiful colors. We made a portable and fancy-looking hardware. Its appearance was designed as a carton train. We named it Forest Train and the name meant that its destination was our rose forest. Anyone “takes” it (that means he/she put a plate in Forest Train) would see beautiful rose produced by E. coli. For more precise control of the color, we explored the relationship between fluorescence intensity and the wavelengths and intensity of input light using ELIASA (microplate reader) and flow cytometry. After quantitative analysis, we could predict and control all kinds of colors our bacteria would produce. Our concept of mixing color on the bacteria cells were also proved to be reasonable and provided a convenient way for scientists and artists to create new colors and artworks. To finally demonstrate our project, we constructed a plasmid containing mrfp, gfp, and bmst1 genes as actuators, and transformed it together with pJFR1-3 plasmids into our E. coli, which could be induced to produce red, green colors and flower fragrance by red, green, and blue light, respectively. A fragrant and vivid flower was created! We greatly improve the previous projects of KIT-Kyoto 2010 and Pairs Bettencourt 2014.We must show our respect for the projects and the teams mentioned above, because they inspired us to pay attention to the combination of art and science, and they did really good job. We wish we can prompt the people’s understanding of art and science by our project, on the basis of the wonderful works done by previous iGEM teams. We developed the dynamic model of the expression of our outputs, to precisely describe, predict and control the expression of the proteins and the generation of our colors. What’s more, our modelling also provided instructions for our experiments. 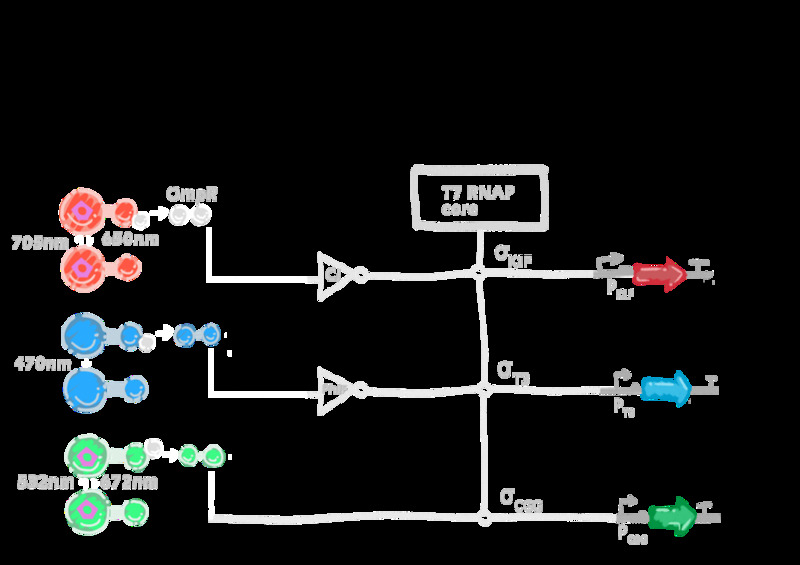 We modified the plasmids we used in the RGB system and tandem expression module and submitted all the parts as a part collection to the registry. Therefore, we provided strong tools for future iGEMers to create fancy artworks and achieve precise control of multiple gene expression by light. As Wilde conveyed in his story, the barrier and combination of art and science still remain worth discussing, so we explored in depth the relationship of art and science in the Human Practices section. One prime barrier of outstanding art and science is the stereotype of defining art as being too selfish and far from the public and science as only about reality with no emotion. We surveyed university students from science and art backgrounds, and to our surprise we found the unconventional idea that the integration of art and science has been well-accepted among the younger generation. Encouraged by our survey , we interviewed many university professors who are experienced in popularization of both art and science, and also communicated with artists in the AS Research Center. During this investigative interview process we gradually got motivated and had a clearer idea of our story to explore the junction of art and science. We discussed with Fankang Meng, who was a researcher in synthetic biology, about the biosafety of our project, and the general strategies of biocontainment of genetically modified organisms. We then sorted out and concluded our discussion contents into several aspects, wishing to provide suggestions on biosafety for iGEMers in the future. More than a hundred years ago, in Wilde’s story, the rose was thrown into the gutter. But today, we UCAS-China iGEMers have picked the rose back up from the gutter, to offer everyone the chance to create their own rose. Inspired by idealism and stirred by imagination, facilitated by scientific gene circuits we develop a practical kit expecting that our work will inaugurate a new era of art and science further inspiring young scientists for future generations. Fernandez-Rodriguez J, Moser F, Song M, et al. Engineering RGB color vision into Escherichia coli[J]. Nature Chemical Biology, 2017, 13(7):706-708. Segallshapiro T H, Meyer A J, Ellington A D, et al. A 'resource allocator' for transcription based on a highly fragmented T7 RNA polymerase.[J]. Molecular Systems Biology, 2014, 10(7):742. Cong L, Zhang F. Genome Engineering Using CRISPR-Cas9 System[J]. Methods in Molecular Biology, 2015, 1239(11):197.